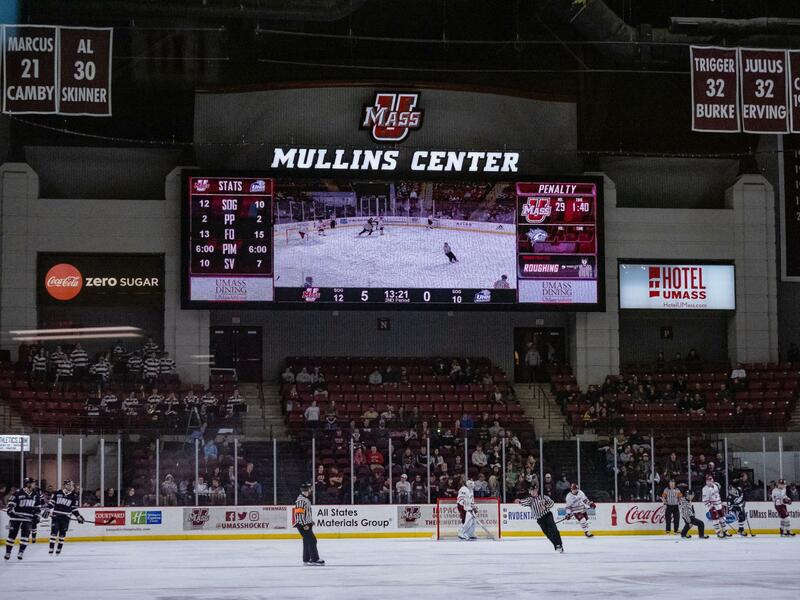 The Mullins Center used to be an easy place for opponents to play the Massachusetts hockey team. UMass used to struggle defending home ice, posting very few wins at “The Bill” over the course of the last decade and had a hard time drawing fans on a night-to-night basis. That all changed this season. The Minutemen, in the midst of their best season in program history, finished with a 17-1 record at Mullins in 2018-19, which included a series sweep of New Hampshire in the Hockey East quarterfinals this past weekend. With the series win, UMass (28-8-0, 17-6-0 Hockey East) moves on to the Hockey East semifinals at the TD Garden, making Saturday’s 6-0 blowout the final game in Amherst. Friday’s 5-4 double overtime dazzler was without a doubt the craziest game at Mullins all year. Down 3-0, and then 4-2, the Minutemen surged back to tie it in the third period off a Cale Makar snipe. Mitchell Chaffee completed the comeback in the second extra frame on a wacky redirection in what was the first multiple overtime game for UMass in four years. Exactly one month earlier, the Minutemen used every last second of regulation to stun Boston College, 4-3, on Jake McLaughlin’s game-winning buzzer beater at home. Just 2.3 seconds were showing on the clock following the goal. UMass completed the sweep the next night with a 4-2 win in Chestnut Hill. At the beginning of the second half of the season, the Minutemen easily took care of business, 6-1, against at the time No. 8 Northeastern. Three first period goals set the tone early and UMass never looked back. The home and home had a lot of hype as it was a meeting between the top two teams in Hockey East at that point in the season. The Huskies won in Boston the following night in overtime. With a No. 1 ranking and a top-10 team coming to town, the Minutemen’s Dec. 8 matchup with Quinnipiac contained the best atmosphere at Mullins on the season. A sold-out crowd couldn’t get loud until the third period when UMass scored three unanswered goals, but when it did, it was deafening. The bout with the Bobcats had playoff atmosphere written all over it after UMass lost 4-0 the day before in Hamden, and it surely didn’t disappoint. Games against UConn and Princeton in late November and early December had entertainment value, as the 7-4 win over the Huskies contained the only penalty shot the Minutemen converted on all year, while the win over the Tigers took extra time. Bobby Trivigno made the most of his opportunity vs. UConn, scoring on the one-on-one opportunity with a few nifty dekes. Oliver Chau was the hero against Princeton, scoring his first goal of the season in the overtime victory. Finally, the first marquee matchup of the season came at Mullins Center on Nov. 8 when Providence came knocking as the fourth-ranked team in the country. UMass was the ninth-ranked team at the time so a top-10 matchup brought quite a bit of buzz. The Minutemen scored the game-winner off a Ty Farmer point shot that snuck into the back of the net. It proved as a sign of things to come as UMass won in very similar fashion the next night in Providence. The Mullins Center was good to the Minutemen this season, with the 8,387-seat arena the site of some of UMass’ most memorable games of the season. I’m truly intrigued to see if Greg Carvel’s success will continue into next year, or if most of the past 2 years of success are Cale Makar related.